Squirt's Showdown is the boss level of Cotton-Top Cove, the third world of Donkey Kong Country 3: Dixie Kong's Double Trouble! Ellie the Elephant is tasked with fighting Squirt here. When defeated, Squirt will drop one of the skis necessary to complete the Turbo Ski. The fight takes place on a mountainside in front of a waterfall. The battle arena consists of six platforms, three on each side of the waterfall, forming a hexagon shape. Squirt attacks from behind the waterfall, above and in between the two uppermost platforms. The Kongs spawn on top of an Ellie Barrel, causing them to transform into Ellie as soon as the battle starts. Squirt's only means of offense is to shoot slowly rotating streams of water from its mouth in an attempt to push Ellie off the edge. In between its attacks, Squirt's eyes will become vulnerable. 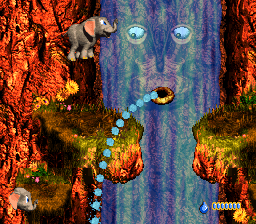 Ellie must absorb water from the waterfall and shoot water into each of Squirt's eyes to force them shut. Each eye needs to be squirted twice; once both are shut, Squirt takes damage and its eyes reopen. The process must be repeated two more times to defeat Squirt. After the first hit, Squirt's starts shooting water for longer periods of time, and after the second hit, its streams start rotating slightly faster. In the Game Boy Advance version, Squirt's water streams are less powerful, allowing Ellie to more easily resist being pushed off the edge by them. They also rotate much faster than they do in the SNES version. Squirt's eyes must now be closed five times instead of just three. After the third hit, Squirt will shoot two streams of water at once, with each one spraying in opposite directions and rotating at the same speed. After the fourth hit, Squirt shoots two streams of water rotating at different speeds. Once defeated, Squirt plummets offscreen and the waterfall disappears, which did not happen in the SNES version. The Kongs are rewarded with a ski after Squirt goes down. Returning to this stage after completing it and beating Squirt again yields a Bear Coin instead. This is the only boss stage that does not give the player an automatic DK Barrel when entering the stage with only one Kong. This is because Squirt is incapable of damaging Ellie in any way other than pushing her off the stage, making the number of Kongs present upon entry irrelevant to the outcome of the fight. This page was last edited on January 22, 2019, at 23:55.